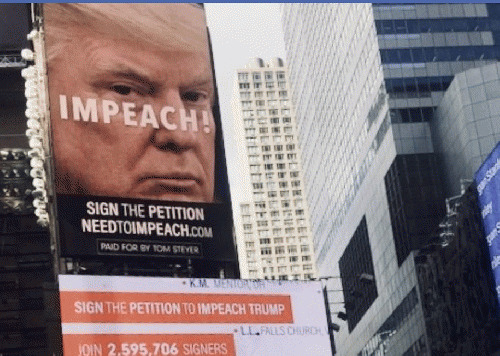 'If you were walking around Times Square today, you may have noticed A Need To Impeach digital billboard, featuring a map and a running count of the 2.5 million Americans who have already signed our petition to impeach Donald Trump. We launched this billboard in Times Square for a simple reason: The American people, Congress, and President Trump himself need to see the nationwide strength of our movement.So we're making a splash that millions of people will see -- and we hope you'll share it far and wide, so folks who aren't walking around Times Square can see it, too. Donald Trump continues to taunt rogue nuclear powers, attempt to cut taxes for wealthy corporations, and undermine our nation's healthcare system. He's a clear and present danger to the United States.Enough is enough. removed. Here is the link to the petition to impeach Trump.? View All 330 Articles in "Trump"